Traditional treatments of industrial effluent, that is, the resulting liquid waste sent out from factories, are mainly based on removing pollutants, and then throwing them in water courses. The search for more sustainable alternatives than that one, which make use of technological advances is the focus of the work developed by Vitor Cano, a doctoral student at the School of Arts, Sciences and Humanities (EACH) of USP. His research aims to do more than just treat wastes; it seeks to obtain energy from them. 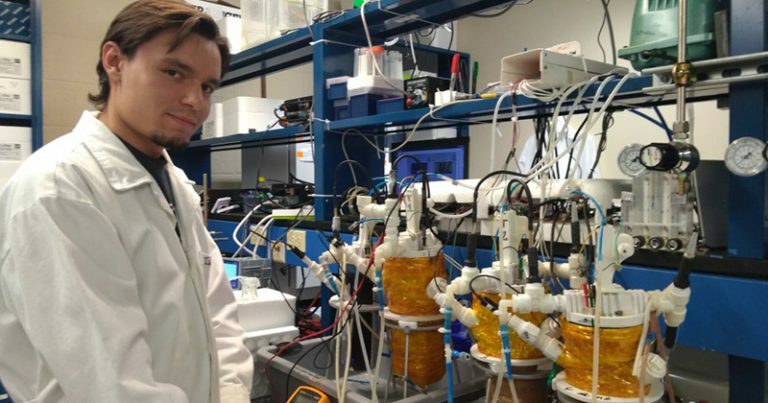 His work – partially conducted at Columbia University, in New York, USA – seeks to conceive and operate a bioelectrochemical system called microbial fuel cell (MFC) in international literature. It is essentially a bioreactor which contains bacteria capable of consuming organic matter as they breathe, but also of transferring the electrons generated in the process out of the cells. This way, it is possible to transfer those electrons to an electrode, thus generating an electric current. “This a very recent and promising technology, as it allows for direct generation of electricity from organic waste, such as industrial wastewater. In other words, it is possible to treat industrial effluent and generate electricity, instead of spending energy”, explains the graduate student in Sustainability from the EACH, who has since 2017 been taking part in the research group coordinated by Professor Kartik Chandran at the Department of Environmental Engineering of the American university. Thus, in addition to being a promising technology for wastewater treatment which protects the quality of surface and groundwater, the process will also allow for treating wastewater with high nitrogen load, such as landfill leachates and industrial and agro-industrial wastewater. The added benefit – not to be downplayed – is the resulting generation of energy. 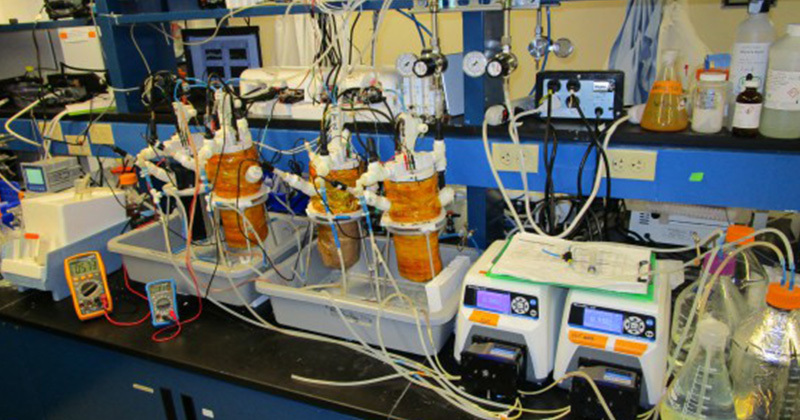 The researcher points out today all known processes for treating or recovering nitrogen exact a considerable energy cost, and because of that he studies the application of an innovative prototype of microbial fuel cell (MFC), conceived at the sanitation laboratory at EACH from low-cost material, for generating energy by using organic matter and nitrogen as fuel. “I practically brought my whole experiment with me, which included bioreactors and an electronic system for online monitoring. Due to the complexity of the experiment, setting it up in a new environment was a great challenge for me”, he stresses. The student is advised by Professor Marcelo Antunes Nolasco, and takes part in the Group for Study and Research in Water, Sanitation and Sustainability, coordinated by the same professor at EACH. The building of the project bioreactors relied on great technical support from expert Kelliton Francisco, who works in the research group headed by professor Nolasco. The preliminary results obtained in Brazil have demonstrated the capacity of the system for treatment and generation of energy. The studies carried out in the United States are still in their very initial phase, but they are likely to confirm nitrogen can be used as fuel in MFC. “At the moment the MFC is undergoing an adaptation phase, with a continued increase of electric current, which might be related to the development of an electrogenic microbial community capable of using nitrogen as an energy source”, says the scientist. The doctoral program is scheduled to be completed in July, 2019. After defending his dissertation, Cano intends to carry on his academic career, working on research projects seeking to develop studies related to sanitation and sustainability.